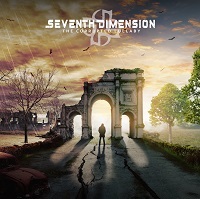 SEVENTH DIMENSION is a Swedish progressive metal quintet from Stockholm, Sweden. They formed in 2009 with guitarist Luca Delle Fave, bass player Rikard Wallström and drummer Marcus Thorén. The trio searched for a keyboardist and vocalist while experimenting with their sound and writing music. They finally found keyboardist Erik Bauer and lead vocalist Nico Lauritsen in late 2010 and entered the studio for the first time in 2011. The band cites DREAM THEATER, SEVENTH WONDER, SYMPHONY X, and KAMELOT as influences, among others. “The Corrupted Lullaby” makes SEVENTH DIMENSION’S 3rd album. At a little over two hours long, it features 14 songs, two of which are instrumental. This is an epic concept album with a story that follows a man named “The Dreamer” and his relationships. He has a woman at his side who loves him, The Lilly, but he cannot see this for he is caught up in the love of another, The Rose, who passed away fifteen years prior and his desire to return to her. The Lullaby is introduced to him by The Illusionist. It is played by a music box and allows him to be with The Rose again in his dreams, but they take away his life as he chooses to live within the dream over reality. His passing leaves The Lilly subsequently raises their child, whom he had no knowledge of before his death, while keeping the music box in hopes that one day her son can be with his father in the world offered by The Corrupted Lullaby. The full story and its chapters can be read on the band’s website. The first song, “The Dreamer’s Requiem” is an instrumental song, with spoken words by some of the characters of the story. It is a very pretty song with strings, keys, soft guitar riffs and synth sounds lending to a harmonious sound. “Empty Days” has a lengthy start full of catchy guitar riffs and solid drum work. Vocals come in at a deep register giving depth to the music. At just over eight minutes long, “When Shadows Call” changes tempo several times in typical prog fashion. Vocals on this song have a lot of range: at time soft and mellow, then deep and dark, and finally bright and high. This song features a female vocalist. “Scent of a Rose” is a dark, melancholic song that carries feeling and emotion throughout. The guitar on certain parts of this song has an old-world classic Spanish feel. Nico’s voice in this song has a wide range of emotions. The pace picks up with “Oct. 5, 1974: Past Remorse” with the first part of the song driven by the double bass work. The first verse slows things down a little but then it is quickly brought back up bringing back the double bass. The rhythm changes throughout the song building drama and releasing it. “Invitation” starts very heavy and sludgy. The pace changes with a tempo change that picks up speed with drums that get faster and faster to build tension that is released into another heavy feeling guitar section. Throughout the chorus, the influence of SYMPHONY X can be heard in the vocals. “The Lullaby” is exactly what the name implies. Instrumental and soft, full of sound that one would find in a child’s music box lullaby. Skip forward to “An Ancient Tale”. This song is full of crunchy guitar riffs. This song has a Middle Eastern theme with the background of the music taking it on as well as the lyrics and vocals portraying such. “When Liberty Calls” shows some of the greatest range of Nico’s vocals from deep lows to powerful highs. His voice is the center piece of this song. “Disconnection” starts with a lullaby sound almost reminiscent of one heard in a carnival. It is followed by heavy guitar and futuristic atmospheric sounds. This all sets the tone for the lyrical content of the song as this is where The Dreamer’s soul starts disconnecting from his body as he chooses to stay in the dreamworld instead of coming back to reality. The last song on the album, “Leaves of Fall” starts very punchy and quick paced. Keys can be heard throughout the song, sometimes keeping with the fast pace and other being the contrast. Several tempo changes are featured building drama that climaxes with a symphonic crescendo and releases. At the end of the song, following silence, the characters The Lilly and her son can be heard conversing about his father, The Dreamer and possibly getting to see him using the music box and its lullaby. Their conversation is finished with the lullaby playing which brings this album to a close. The many influences of this band can be felt throughout the album. A very prog metal band, the songs flow from sweet and elevating to dark and somber. Many tempo and rhythm changes keep the album interesting. The band uses every instrument as well as ambient and atmospheric sounds to add dynamic variation to each song and express the many moods that the story tells over the course of the album. The production is well done. A well-balanced mix allows for each instrument to be heard. Punchy, powerful drums and crunchy guitars are not lost in all the sounds used throughout. Every detail is pronounced in a way to add to the story.